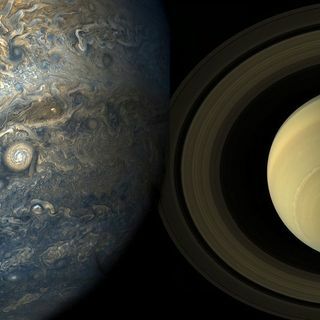 It’s incredibly difficult to get an inkling of what is going on inside gas giants Saturn and Jupiter. But with data deliveries from the Cassini and Juno spacecraft, researchers are starting to learn more. Science Staff Writer Paul Voosen talks with host Sarah Crespi about new gravity measurements from Cassini’s last passes around Saturn. Using these data, researchers were able to compare wind patterns on Saturn and Jupiter and measure the mass and age of Saturn’s rings. It turns out the rings ... Más informaciones are young, relatively speaking—they may have formed as recently as 10 million years ago, after dinosaurs went extinct.